Charlie Tatum looks at how Adam Pendleton’s largest solo exhibition to date combines disparate revolutionary histories and asks viewers to consider the relationship between art and activism. 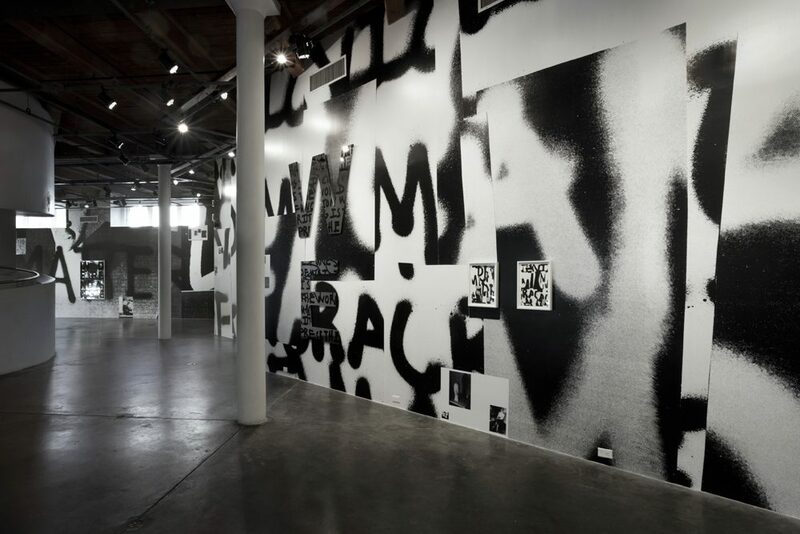 Installation view of “Adam Pendleton: Becoming Imperceptible” at the Contemporary Arts Center, New Orleans. Courtesy the artist; the Contemporary Arts Center, New Orleans; Pace Gallery, New York; Galeria Pedro Cera, Lisbon; and Galerie Eva Presenhuber, Zurich. Photo by Traviesa Studio. 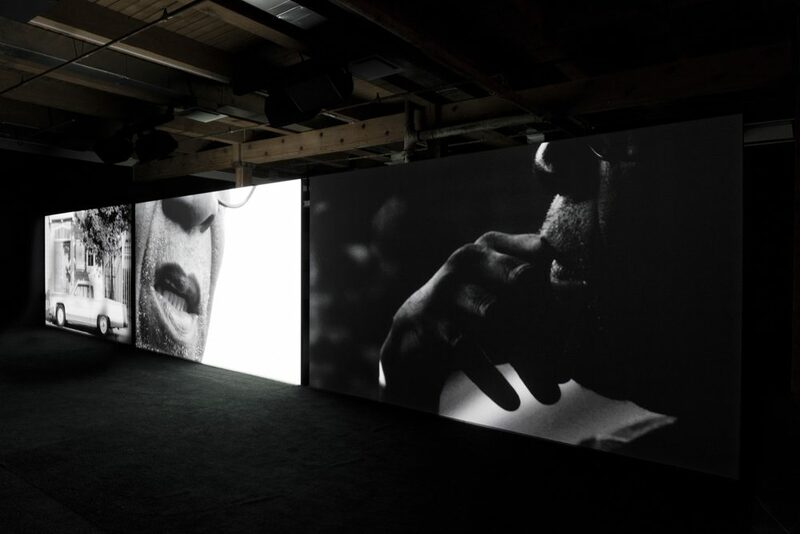 “Adam Pendleton: Becoming Imperceptible,” the artist’s largest solo exhibition to date, has transformed the Contemporary Arts Center into something slick, high-budget. Everything is black and white. Every object is pristine—seemingly untouched—and painstakingly installed. This marks a turn for the CAC, whose roster of exhibitions in recent years has been cluttered with traveling shows and haphazardly themed open calls. Pendleton’s, the first major exhibition curated by Andrea Andersson, who joined the CAC in 2015, feels like a step in the right direction, reimagining the three floors of the former K&B Drugs warehouse as a home for top-tier exhibitions. The first floor is almost entirely wrapped in sheets of vinyl, a medium Pendleton debuted at last year’s Venice Biennale. Outside the Belgian Pavilion, visitors were greeted by a declarative flag reading BLACK LIVES MATTER in grafittied letters. Inside, imagery from that flag re-appeared as large decals, backdrops for his framed works. In the CAC’s first-floor gallery, digitally collaged snippets of these same spray-painted words cover the walls, a collection of abstracted gestures. While using the full phrase in Venice signaled a direct allegiance to the movement, in New Orleans, Pendleton avoids didacticism by dividing and scrambling the letters. An A bleeds into an M bleeds into a C. Pendleton’s interest in language is not new; his Black Dada paintings, inspired by Amiri Baraka’s (then LeRoi Jones) controversial poem “Black Dada Nihilismus,” embrace the endless potential of blackness, chaos, opacity. Here fragmentation emphasizes possibility, forcing the viewer to put the pieces together, to play an active role in creating meaning. As a general rule, Pendleton’s works don’t give the viewer enough information to “make sense” of them. A series of new ceramic works—Code Poems—are inspired by poet Hannah Weiner’s investigations into the form of Morse code, disrupting the symbolic language with inserted squares, escaping translation or any semblance of literalness. A video-portrait, Satomi, 2009, on the second floor, is a silent, six-second loop of the indie band Deerhoof’s Japanese lead singer. The video seemingly skips, its subject stuck infinitely repeating, never revealing anything about herself. A painted wall work, Notes on Black Dada Nihilismus (proper nouns), 2009, reduces Baraka’s poem to a string of its proper nouns. Another video, installed as an immersive three-channel environment on the CAC’s third floor, presents narrated slices of documentary footage as Black Panther David Hilliard walks the viewer through Oakland, California—the building where the party ran its breakfast program, a house marked by bullet holes where Huey Newton was shot, the moment when Hilliard first met Malcolm X.
Pendleton is a compulsive gatherer of images and texts, and his references—filmmaker Jean-Luc Godard, the Black Panthers, poet Ron Silliman, painter Josef Albers—accumulate. (Only an extremely short description of the source imagery is included in the works’ titles.) Pendleton is less concerned with what the images are and where they came from than he is with mixing them together. This sense of interconnectivity is made more explicit in his ongoing Systems of Display series, a collection of small, mirrored works printed with found historical photographs: photojournalist Ian Berry’s documentation of Congolese liberation, a set of Bauhaus dinnerware, a tribal mask from a Liberian secret society. A single black letter floats on each plexiglass surface. An alphabet or a word or a manifesto can’t be formed with a single letter, nor can a visual language be made from one image exclusively. Pendleton’s references place his work within a web of associations—the Black Arts Movement, Africa’s anti-colonial struggles, the radical European artists who brought on high Modernism and the white cube as we see it today. Pendleton’s fragments insist on connection—that the historic white avant-garde can’t be separated from black resistance movements; that discrete histories are a myth; and that, today, we can’t remove ourselves from the discourses that have preceded us. Pendleton embraces the ambiguity of these disparate parts and proposes this reclamation as a politicized tactic in its own right that takes place in the museum rather than in the streets. “Adam Pendleton: Becoming Imperceptible” is on view through June 16, 2016, at the Contemporary Arts Center (900 Camp Street) in New Orleans.